GotMedia sells a complete line of Inkjet Printable CD-R Media in Orange County, CA. There are 2 things to consider when choosing an inkjet printable CD-R surface. White inkjet media is the most popular for most common printing jobs; such as photographic printing. Silver inkjet printable CD-R media offers a metallic or iridescent look. Most CD DVD Inkjet Printers can print on various surfaces including Waterproof CD-R Media. If you would like assistance in choosing the right inkjet printable CD-R Media product for your needs, don't hesitate to call one of our knowledgeable representatives at 1-866-409-1090. MAM-A Mitsui CD-R has a reputation that is synonomous with superior quality. This Mitsui CD-R has a silver inkjet printable surface for use with a color inkjet printer.The silver inkjet surface gives colors an iridescent look. These are also hub printable which means you can print on more of the surface and closer to the center hole. You can also write on the surface with a CD pen. MAM-A Mitsui CD-R has a Reputation that is synonomous with superior quality. This Mitsui CD-R has an edge-to-edge white inkjet printable surface for use with a color inkjet printer. Edge-to-Edge means you can print across the full surface of the CD-R. You can also write on the surface with a CD pen. MAM-A Mitsui CD-R has a reputation that is synonomous with superior quality. This Mitsui CD-R is a 650 MB/ 74 Minutes capacity and has a white inkjet printable surface for use with a color inkjet printer. You can also write on the surface with a CD pen. Inkjet MAM-A/Mitsui Digital Audio CD-R 11272 has a white inkjet printable surface for usesr that can print directly on the surface of the CD-R with an inkjet printer. The MAM-A Mitsui Digital Audio CD-R has a stacking ring and therefore can't be printed in the hub. MAM-A White Inkjet Archive Gold CD-Rs are for users that want to print with a color inkjet printer, or just simply write on the surface with a CD pen. Archive Gold CD-Rs have a 24 karat gold reflective layer which improves the recording accuracy, ensures longevity and has the most resistance to chemical breakdown and oxidation. Spin-X CD-R has been popular among consumers and professional duplicators for years. These CD-Rs have a white inkjet printable surface for users that want to print with a color inkjet printer. These are hub printable which means you can print on more of the surface and closer to the center hole. You can also write on the surface with a CD pen. Spin-X CD-R has been popular among consumers and professional duplicators for years. These CD-Rs have a silver inkjet printable surface for users that want to print with a color inkjet printer. The silver inkjet CD-R gives colors more of a iridescent look. These are hub printable which means you can print on more of the surface and closer to the center hole. You can also write on the surface with a CD pen. Spin-X Diamond CD-R is recommended if you are looking for a recordable CD-R with no color on the record side. Silver CD-Rs have a green hue to the record side whereas the Diamond CD-R is pure silver. These CD-Rs have a white inkjet printable top surface for those who have a color inkjet printer. These are not hub printable. You can also write on the surface with a CD pen. Spin-X Diamond CD-R is recommended if you are looking for a recordable CD-R with no color on the record side. Silver CD-Rs have a green hue to the record side whereas the Diamond CD-R is pure silver. These CD-Rs have a silver inkjet printable top surface for those who have a color inkjet printer. These are not hub printable. You can also write on the surface with a CD pen. Ridata CD-R is an inexpensive disc with great reliability, providing great value for the user. These CD-Rs have a white inkjet printable surface for users that want to print with a color inkjet printer. These are hub printable which means you can print on more of the surface and closer to the center hole. You can also write on the surface with a CD pen. Ridata CD-R is an inexpensive disc with great reliability, providing great value for the user. These CD-Rs have a silver inkjet printable surface for users that want to print with a color inkjet printer. The silver inkjet CD-R gives colors more of a iridescent look. You can also write on the surface with a CD pen. Titan Media is proud to present a new line of the most affordable White Inkjet Hub Printable Printable CD-R in the market right now. Titan 52X CD-R have high-resolution White Inkjet Hub Printable. They also serve as a cost saving alternative when compared to thermal printing. Verbatim Data Life Plus CD-R is professional grade with superior reliability and consistency. This Verbatim CD-R has a white inkjet printable surface for use with a color inkjet printer. You can also write on the surface with a CD pen. Verbatim Data Life Plus CD-R is professional grade with superior reliability and consistency. 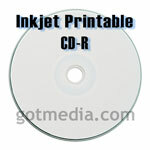 This Verbatim CD-R has a white inkjet printable surface for use with a color inkjet printer. These are hub printable which means you can print on more of the surface and closer to the center hole. You can also write on the surface with a CD pen. Verbatim Data Life Plus CD-R is professional grade with superior reliability and consistency. This Verbatim CD-R has a silver inkjet printable surface for use with a color inkjet printer.The silver inkjet surface gives colors an iridescent look. You can also write on the surface with a CD pen.